Enhance your home with a custom exterior deck with EVERGREEN Fence & Deck’s quality design and workmanship. 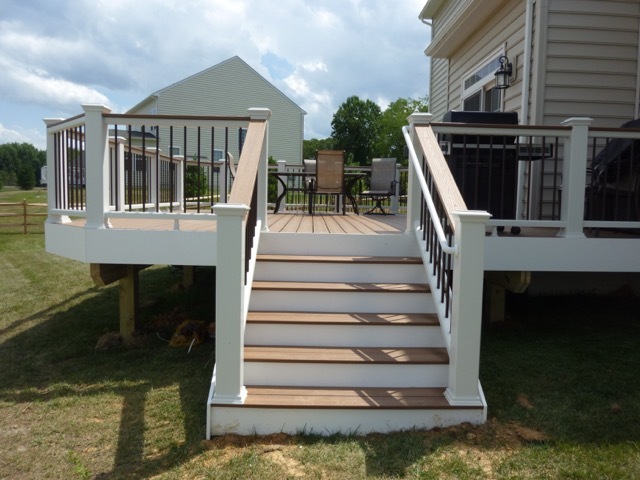 Our experienced staff will work with you to design and build a deck to exceed your expectations. A variety of options are available — from traditional to custom shapes and optional features including benches, trellis and pergolas, privacy screening, low-voltage lighting, under deck sheds, dry space and more using wood or low maintenance composite and vinyl to enhance your project. Evergreen Fence & Deck builds and renovates decks in all of Montgomery County, MD and Howard County, MD, including Olney, Columbia, Clarksville, Damascus, Beltsville, Darnestown, Chevy Chase, Ellicott City, Gaithersburg, Germantown, Glenwood, Rockville, Bethesda, Kensington, Laurel, Mount Airy, New Market, Potomac, Silver Spring, Wheaton, and Woodbine. 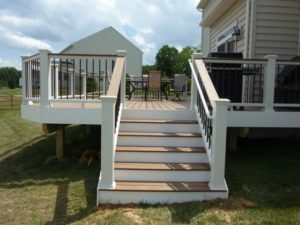 EVERGREEN Fence & Deck in Brookeville, Maryland, is a deck contractor and builder with a reputation for building high quality, custom decks in Montgomery County, MD, Howard County, MD and surrounding areas. Our company owner is present on every job, ensuring the highest quality of workmanship and full satisfaction in your new deck. Give us a call today Call on us for a free quote or to learn more about our prompt, professional deck contracting services for your home or business. Hours: Monday-Friday 7 a.m.- 4 p.m.